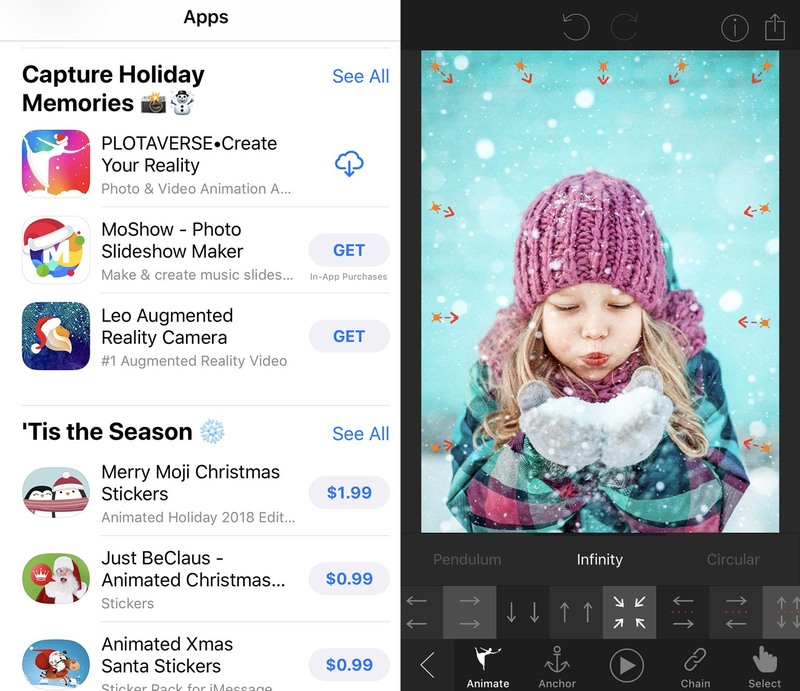 App Store Features Plotaverse in "Capture Holiday Memories"
MAUI, Hawaii - Dec. 13, 2018 - PRLog -- The App Store's biggest holiday feature this year is one of the most anticipated photo app gadgets: The free, automated photo animation app within Plotaverse. The app's new automation feature globally hit the App Store on December 12, and is free to download and share. The founders of Plotaverse took thousands fan requests to heart, and added 25 photo animation presets to their iOS app with more on the way. All users will be able to instantly add motion magic to any normal photo with just one tap. There is no need for video or motion graphic skills. The small team of artists at Plotaverse already took care of it, and skillfully designed each motion preset to bring holiday, travel, wedding, drone and everyday moments back to life within seconds. PlotaTV is one of the young startup's most recent additions to the Plotaverse app in their mission to help artists promote their work. Motion artists can be seen sharing animation tips and touching success stories, including how they were discovered by clients on Plotaverse's sharing platform. The production is filmed in a refreshingly honest and laid back style, while casting light on reasons why motion art is taking over the content creation market. Viral Plotagraphs have been stirring up social media thanks to celebrity trend setters like Kim Kardashian, Ariana Grande, Gary Vee and Paris Hilton. "I'm obsessed with it" Paris told Elle Magazine about Plotaverse. Her sparkling Plotagraphs have reached new iconic heights on Instagram and even on global media. "It's so fun and you can add a bunch of things like glitter, butterflies, hummingbirds, or fire" Paris raves about the app's PlotaFX overlays. A special holiday wonderland experience can be created by unlocking hundreds of cinematic PlotaFX video overlays with in-app purchases. Expect to bedazzle friends and family with magically moving seasonal greetings by adding sparkling ornaments, colorful presents, falling snow and twinkling stars. Over half a million mesmerizing and captivating motion artwork from around the world can be enjoyed on Plotaverse's high resolution sharing platform. To start animating photos and find out more about the world of motion art, visit the App Store for free download of Plotaverse.